I was flying to New York. You cannot help but feel exited by such a journey, it is true for me that nowadays most flights are pedestrian affairs, not really much to get excited about, but being in this sparkling new airport at dawn flying to NYC is something special. Though I do think someone should point out to them that the name is perhaps not the best one they could have come up with; I can just hear the snickers of the Brits ringing around that cavernous space. With an hour or so to kill I decided to get some grab shots. 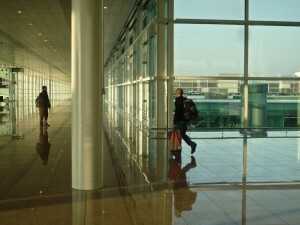 I was being surreptitious, using my little Lumix camera; I’ve had problems at other airports in the past. I realised later, when more people appeared (some wielding their ‘pro’ DSLRs and getting absolutely no hassle from the ever present police) that I need not have worried. Well anyway, I got some shots I think are good, and I am used to this compact now and know how to trick the metering to get exposures I like, it also have a 24mm equivalent wide angle lens which is my favourite focal length. The light was astounding, I was there just before sunrise and the changes I witnessed as the sun came up were incredible, the place was also quiet as this hour; it was easy to get shots of empty spaces full of that limpid light. Next time I will break out the DSLR, a tripod and chance my luck!